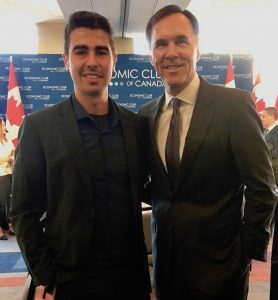 Thursday November 22, our Managing Partner, Jayant Kumar, and Associate Partner, Omer Kaya, attended Minister of Finance Bill Morneau’s briefing on the Fall Economic Statement 2018. Focusing on “growing the economy by investing in middle class jobs,” the Minister highlighted important points of the Statement including business, innovation, trade, and social initiatives. As our President and CEO Dave Watters describes it, “the Fall Economic Statement is actually the budget rather than an update.” The Statement provides for an overall view of the Canadian economy; demonstrates existing and new initiatives, measures and goals; and addresses challenges ahead. The Canadian economic growth was 3% in 2017, placing it first among G7 countries. In the last three years, 550,000 new full-time jobs were created, and the share of working age women employed has reached the highest in Canada’s history. The projected deficit is $18.1 billion for the current fiscal year, which is down $0.9 billion. The overall unemployment rate is slightly down to 5.8% from 5.9% last year. Presently, Canada is experiencing the lowest unemployment level in the last 40 years. Three world class corporations decided to invest in Canada this year. Amazon is expanding its tech hub in Vancouver with a new office that will employ 3,000 people. The tech giant also announced that it will open new centres across Canada including one in Ottawa. Siemens, a German industrial manufacturer, chose Fredericton, New Brunswick to establish its global cybersecurity centre. Linking up the company’s expertise in critical infrastructure protection and the province’s emerging cybersecurity ecosystem is expected to create opportunities for Canada’s global cyber exports. LNG Canada, a joint venture of five large companies, announced a major liquefied natural gas export facility in British Columbia with its $40 billion investment. This is the largest single private sector investment in Canadian history. The federal government introduced some initiatives for businesses. For tax purposes, the Tax Cut Incentive enables companies to write off the full cost of machinery and equipment used in the manufacturing and processing of goods. The Accelerated Investment Incentive was created to support investment by businesses of all sizes and across all sectors of the economy. To support business innovation, the federal government allocated a further $800 M over 5 years to the Strategic Innovation Fund. One-eighth of this amount was assigned to the forest sector alone. Under the Venture Capital Catalyst Initiative, the government announced $400 M of new investments. For charitable, non-profit and social purpose organizations, the government put forward the Social Finance Fund for access to new financing. Advance pay equity and measures to support Canadian journalism are other important social initiatives introduced in the Fall Economic Statement. Canada’s exports are heavily reliant on the US market. On average, 75% of Canadian exports are going to our southern neighbour and this might create vulnerabilities. With the Fall Economic Statement, the federal government pledged to increase overseas exports by 50% by 2025 with its Export Diversification Strategy. Moreover, some steps were planned to remove barriers to trade in order to catalyze trade within Canada. These steps include harmonization of food regulations and inspections, alignment of regulations in the construction sector, and modernization of federal regulations. Following the Minister’s speech, Graham Richardson, Chief News Anchor for CTV News, had tough questions for Minister Morneau during the interview, with a special focus on the issues around the Western pipeline project and its impact on the economy. Especially in Alberta, the unemployment rate is fluctuating around 8% although Canada’s unemployment rate dropped to a four-decade low. There are two issues associated with this challenge and the first one stems from pipeline transportation constraints in Western Canada (e.g. environmental constraints innate to the construction and operation of the pipeline itself). Due to a lack of agreement on the pipeline project and pressures on the sector’s logistical capacity, increasing amounts of oil is being transported by rail. Rail transportation, however, raises various concerns: it is more expensive and riskier to ship crude oil by rail than by pipeline (risk of spills etc.). The result is a significant discount on the price of Canadian crude oil compared to the international benchmarks Brent and WTI. The second issue is that the industry heavily relies on the US market, which renders Canadian crude oil prices vulnerable to developments in the US. Recently, market prices for Canadian crude oil have declined to historic lows and the price gap between Canadian and American crude has widened. The Fall Economic Statement encompasses other initiatives, details of the initiatives mentioned above, as well as Canadian objectives and challenges.